Our beloved little terrier died, and my husband went on a week-long drinking binge, leaving me terrified that he was actually going to be one of those people who drinks himself to death. If you have not walked this path, let me assure you, it is dreadful! The economy tanked, so in addition to losing a quarter of the income from my job when my hours were cut, we lost a big chunk of income from my husband’s commission-based salary — with his two grown-up girls relying on us for college loans. My mum started showing the symptoms of Alzheimer’s, got lost in the Arizona desert, had to move into an assisted living home and promptly set it on fire. Again, if you have not faced this disease attacking someone you love … I pray you never have to. If you are facing it now, my heart goes out to you. I developed a very painful (and humiliating) medical condition that required surgery, lengthy recovery, and yet persists to this day. A hurricane hit our house! My husband became fixated on my last boyfriend I had before him, and spent a solid six weeks drunk and terrorizing me regarding a night 20 years ago that I couldn’t even remember — before he went into rehab, came out and started drinking again. Our new beloved terrier got lost (and found, thank God! ), suffered bladder stones and had to have surgery, and nearly died from liver failure after being poisoned by a sago palm in our yard. No, I wasn’t delirious with joy over any one of these events, but here’s the thing … each one nudged me closer to Christ, which is to say, closer to love, closer to joy, closer to peace. Each one forced me to a better place in God! My painful heartaches led me to a place where I am more filled with joy, vitality, hope and love than ever before. My problems were there for my promotion. What Joel said was true, and in a much bigger way than he could even have imagined. Trust me. I’m a loser. And I’m telling you this. I can honestly say, despite the bullets above — or maybe because of them — these days with Jesus, these past eight years that I have been coming to know Him, have been the happiest and best of my life. I can see now that my problems and struggles are where Jesus does His best work, and I would not change things. Happy moms with plenty of money and healthy children have their little piece of heaven in their home … but I have heaven all the time, always with me, in Jesus, who holds my life in His. Most winners have neither the time not the impetus to pursue God in this way. But we lucky losers do! Our lives didn’t turn out like we wanted, so we have nothing better to do than wait in silence and darkness for Jesus to meet with us and heal us. And when He does … WE WIN! We come into the fullness of relationship with Him, we come to know the One who is everything and the only thing! Still with me? I trust if you went and got Waking the Dead that you are reading it and following the program. I did, and I want to tell you, it propelled me to a crazy place of joy, joy. Joy, joy! Now: it doesn’t have to be that book; I think God used that book for me because He knew I would relate to all the epic sci-fi/fantasy stuff, and I did. Maybe He will even use this book to speak to you because you relate to all the LOSER stuff in me! Wouldn’t that be great? I doubt it though, because I’m such a loser, who would listen to me? Wait! That is the point of this book! “God expects more failure from me than I expect from myself,” Brennan Manning used to say. And he should know! He was an alcoholic, even after he got “saved,” and continued to binge even as he was ministering to multitudes through his speaking and writing. The world would have called him a worthless drunk! But his books have brought hope to so many people! (Including me.) Just so you’re with me: I’m a big old loser like Brennan Manning and you, so you can trust me. This is sort of how Jesus helped me approach painful stuff in my past and live through it, because when we did, then the pain stopped. Now all this interaction with Jesus which I am describing to you here, it happened over many days and weeks, and months, moments at a time, as I reached out and invited Him to meet with me and heal me. And it was all spiritual. Or, you might say, all in my head, in my mind. In a way I would relive the pivotal events in my life that had sent me down a destructive path, only I did so with Jesus there beside me, showing me what should have happened, how things could have been. And somehow, this allowed the events themselves to remain in my memory, but leeched of all the pain and bitterness. Much of the horror of them washed away … somehow being anchored in Jesus, who is all for me, helped me accept the past, embrace the lessons of it, and move on. I know. It sounds crazy. Or like therapy. Is that how therapy works? Well, what if your therapist was Jesus, and He could totally hone in on the key events that shaped your whole loser life, and make it all better? That’s what He did! And He loves you, too! Loser’s Guide to God’s Grace 05: If It’s Free, What’s It Worth? 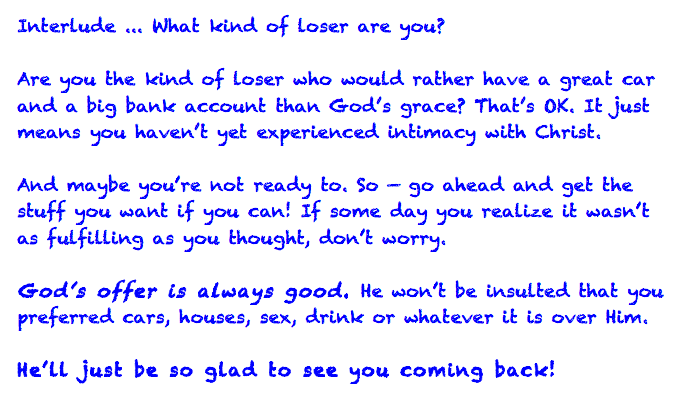 If you’re a grubbing, selfish loser like me (and I am not saying you are), about now, you’re thinking: if this gift of grace is free, how worthwhile can it be? After all, you get what you pay for! Thankfully grace reverses that whole scenario, and we losers get stuff wildly unaffordable to us! We get what we can’t and never will be able to pay for. We get the best, the most wonderful, the beyond-imagining … well, let me not get ahead of myself. Yes, the gift of grace is free, and yet, it is invaluable. Trust me on this. It’s even better than what Joel Osteen promises you! When Joel tells you to stay in faith through your problem because God is going to use it for your promotion, for instance, we think what he is saying seems true to him because he hasn’t suffered as we have suffered. But now, I want to tell you some good news, and some bad news. 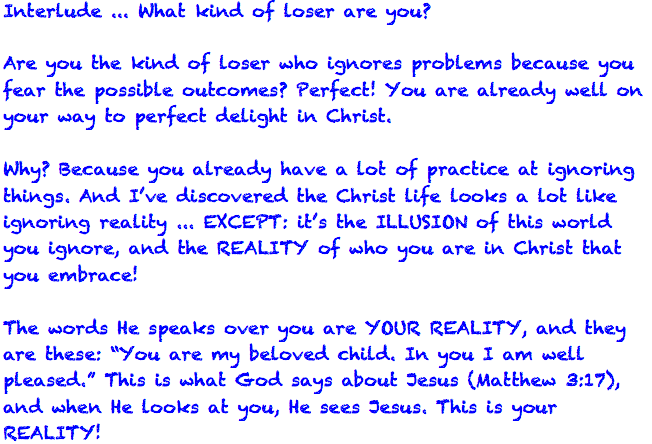 First, the good news: the Gospel is the Gospel, and it is true for winners and losers alike! So when Joel says to stay in faith because God is going to use that problem to promote you, he is exactly right! Yay. The bad news: the “promotion” part doesn’t literally mean you are going to get a job promotion. Nor does it mean you are going to experience a financial breakthrough, a divine healing, a miraculous restoration of a relationship, a fulfilling marriage, healthy family or any other material “blessing” you can imagine. These things are great. God is able to give them to you, and I hope He does. But in comparison with the “promotion” you’re entitled to because of your position as God’s beloved child, these things are small potatoes. Yes! The gift of grace, though free to us, is worth far, far more than any of that little list of rewards that we hanker for. I know this, because I’ve received it, and I’m a loser, same as you! When you step into your identity as God’s beloved, you step into your identity as God’s beloved. Nothing can be better than that! I don’t even know how to tell you how amazing it is. And I know that you won’t even understand what I am saying about it until it actually begins happening to you, but let me try. It will take a return to my stupid story. Next time. Loser’s Guide to God’s Grace 04: What about “cheap grace”? First off, Dietrich Bonheoffer was a very heroic guy, and I admire the hell out of all he did to try to save people from Nazi death camps prior to and during World War II. And even to bring down Hitler’s government. His heart was obviously in the right place, and his legacy is undisputed. I will let our spiritual father Brennan Manning answer this, with words from his autobiography, All Is Grace. My life is a witness to vulgar grace–a grace that amazes as it offends. A grace that pays the eager beaver who works all day long the same wages as the grinning drunk who shows up a ten till five. A grace that hikes up the robe and runs breakneck toward the prodigal reeking of sin and wraps him up and decides to throw a party no ifs, ands or buts. A grace that raises bloodshot eyes to a dying thief’s request–”Please, remember me” — and assures him, “You bet!” A grace that is the pleasure of the Father, fleshed out in the carpenter Messiah, Jesus the Christ, who left His Father’s side not for heaven’s sake but for our sakes, yours and mind. And I think maybe the incomparable Robert Farrar Capon wouldn’t be out of place here, either, from his The Mystery of Christ — and Why We Don’t Get It. I’ve always had a problem with the phrase “cheap grace.” As far as I’m concerned, nobody can make God’s grace in Jesus any cheaper than it already is: It’s free …. I guess what I really don’t like is the way people start out by defining sin as “moral failure,” and then go on to think that if they commit “sins” they’ll cut themselves off from grace. That’s all nonsense, of course: “sinners” are the very thing God gives His grace to — lost sheep, lost coins, lost sons. As a matter of fact, the true New Testament opposite of sin isn’t virtue, or moral success, or getting your act together: it’s faith in the grace that takes away all the sins of the world. Paul says, “All that is not of faith is sin.” And Jesus says, “The one who believes is not judged.” We’re not on trial: “There is therefore now no condemnation for those who are in Christ Jesus.” And we shouldn’t weaken that by giving a narrow interpretation to “those who are in Christ Jesus”: the whole world is in Him, reconciled and made into a New Creation by the Mystery of Christ. Thank you Paul Ellis, Robert Farrar Capon and Brennan Manning. You have forever obliterated the idea of “cheap grace” and taken the pressure off us losers who knew we could never live up to Dietrich Bonheoffer’s standards.